When he brought home some Guinness one night for me to try, he didn't have any high hopes that I would like it. But surprisingly, that was one of my favorites. I liked the smooth dark, slightly bitter taste. Well, that just started the ball rolling. Next thing I knew, he and I were boarding a plane headed to the lush emerald green island of Ireland. It was an incredible trip of pub-hopping in downtown Dublin, touring the Guinness factory, taking a train ride out into the country passing by beautiful farms, cozy little towns, and seeing lots of ruins of ancient castles. And of course, eating some spectacular food. If you ever get a chance to go to Ireland, do it. All the locals were extremely friendly and there is so much to see and do. Anyways, I digress. Back to the recipe. 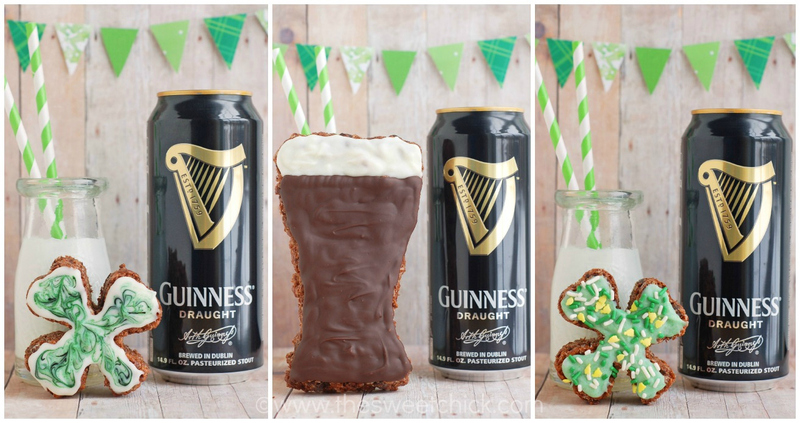 I have used Guinness in baking before in cupcakes and brownies. But I was looking for something different. How about a crunchy Guinness treat? Yeah, that's the ticket. Guinness goes great with chocolate, so I paired it up with dark chocolate. I boiled down a cup of Guinness to less than 1/4 cup, then mixed it with Ghirardelli bittersweet baking chips before adding it to the marshmallows and Rice Krispies. And on top of that , mixed in some Hershey's Dark Chocolate Chips. As if that wasn't enough dark chocolate for you, I topped it off with some Guinness dark chocolate frosting that is to die for. 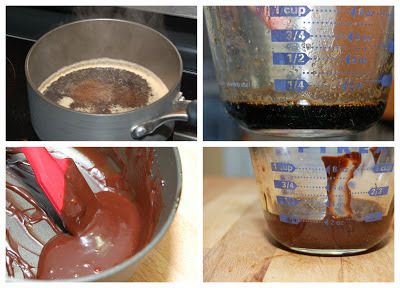 I boiled down another cup of beer and again mixed it with some bittersweet chocolate before adding it to a dark chocolate frosting. Oh. Em. Gee. I was eating the frosting by the spoonful. You really don't taste any beer in either the treats or the frosting, but the boiled down syrup does bring out all the goodness of the dark chocolate. The frosting is light, fluffy and not overly sweet. 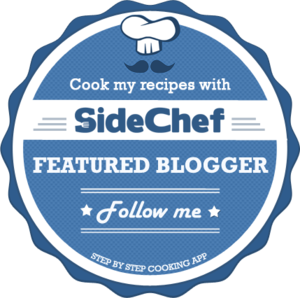 It is a perfect pairing for the treats, but I think it would be great for cakes and cupcakes as well. 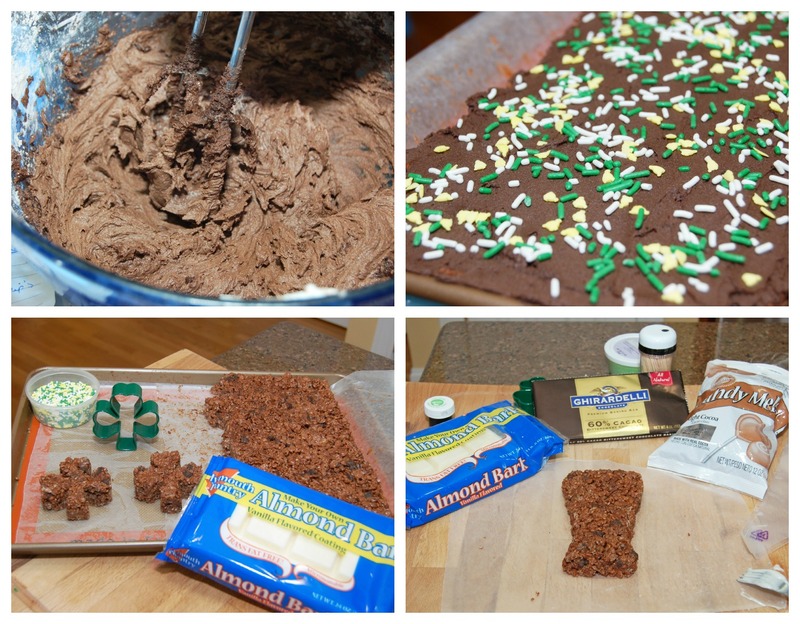 If you don't want to make the Rice Krispie squares with frosting, you can cut them out into shamrock shapes and cover them with some almond bark or candy melt and decorate. I even got a little silly and traced out a pint glass shape and decorated it with white almond bark and chocolate candy melts. 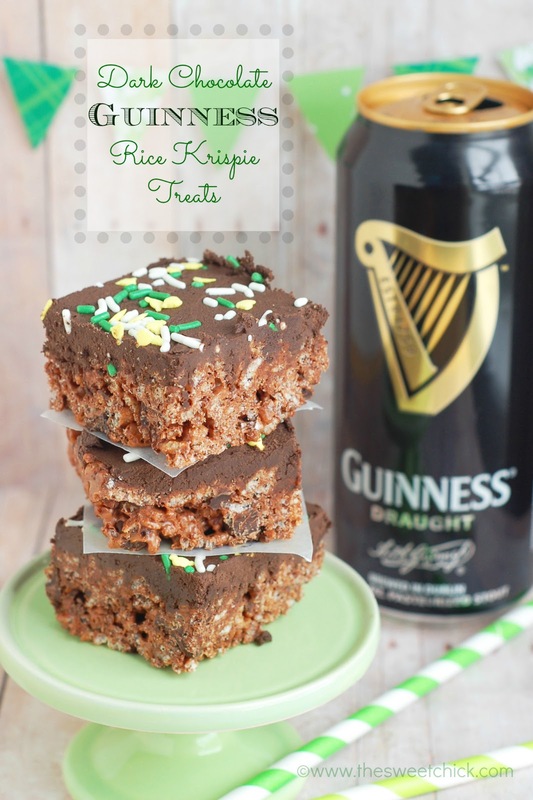 You can have as much fun as you like, but for the love of Guinness, don't waste any beer while making these. You will need to open two cans of beer, just make sure there is someone there to drink the rest. And in case you didn't figure it out already, these are NOT for children. Although I did burn off most of the alcohol, I still made sure to keep these far away from my children. They can wait till they are 21 years old to eat them. Place beer in a small saucepan and bring to a boil over medium heat. Boil for 15 minutes, until beer is reduced to a little less than a 1/4 cup of liquid. Remove from heat and add the beer/chocolate mix. Stir until completely mixed. Then add the Rice Krispie cereal and the Hershey's chocolate chips. Mix until all is well incorporated. 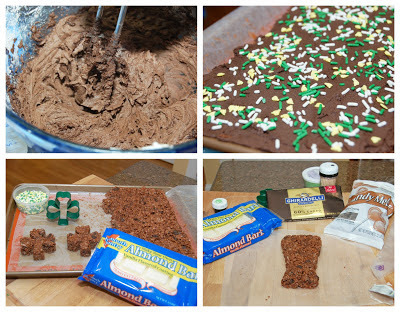 Spread the frosting evenly over the chilled Rice Krispie Treats with a spatula and add sprinkles if desired. You can keep the treats refrigerated if you are not eating them right away. However, they can be left out at room temperature. I wish I could taste a beer from Greece or Italy, like it, and then my husband takes me on a trip there! That would be perfect :) Your treats look delicious! lol. Well it helps if he wants to go really bad too. Wow! That looks really delicious! Made with beer huh! The guys would love this! I had no clue you could boil beer down and mix it with chocolate! What a fun krispie twist!!! Fun and festive St. Paddy's treat! Guinness is my favorite beer and I've actually never baked with it, so I'm very inspired. 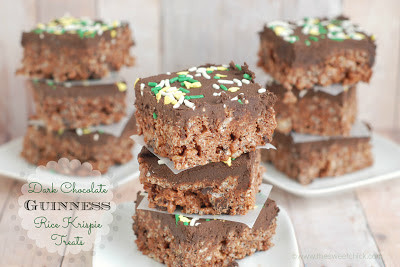 I love dark chocolate and rice krispie treats were always my favorite growing up. There's so much deliciousness happening all up in your krispie pan and I can't wait to give it a go! Love these. The cup is wonderful. Thanks for sharing at Two Cup Tuesday at Pint Sized Baker. I've pinned it!